There are a few simple truths around our house when it comes to food. We love food. We love trying all sorts of new foods, even. However, deep down, we are both meat-and-potatoes people to our very core. We are steak people…medium-rare steak people. When we find ourselves in a quandry over what we would like for dinner (mostly on Fridays, since we drive up North after work) we almost always choose the ritual pizza or steak-and-potato option. 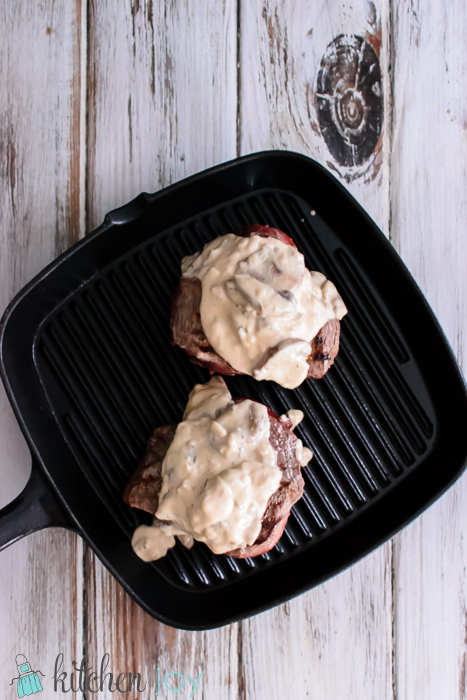 While at times we turn to steak as a good-ole-standby meal, there are other times when you make a concentrated effort to make it a little bit extra special, and around here, if you want to make a good thing even greater, you simply must add cheese. Right? 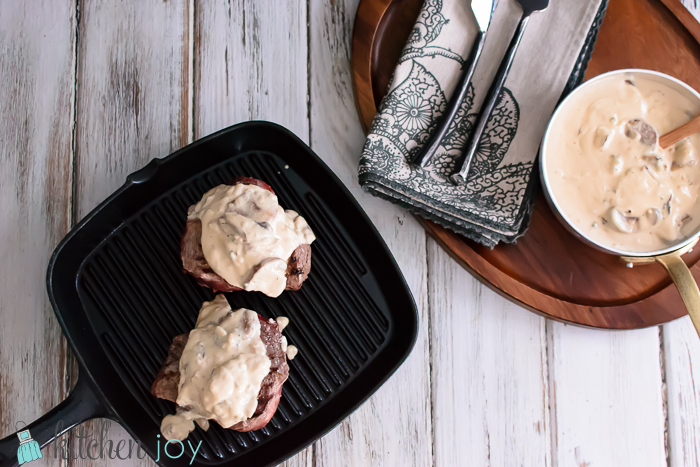 This Creamy Mushroom Gorgonzola Sauce is a rich, flavorful addition to your juicy grilled steak. 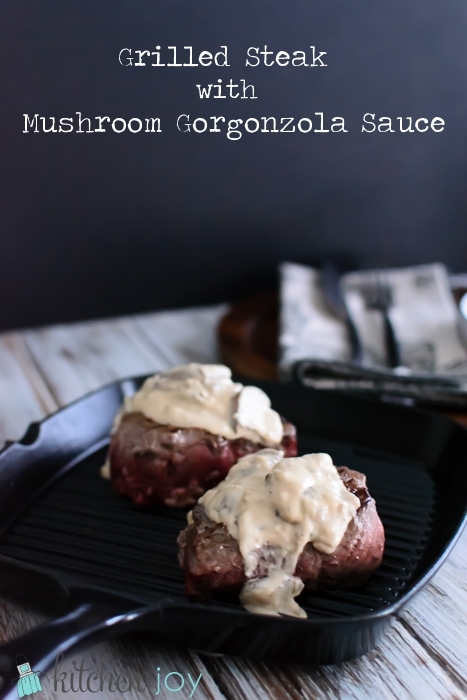 It is packed with the tangy-ness of the Gorgonzola but also the earthiness of the mushrooms. You’re just going to love it, and best of all, it’s so easy to make! If you’re grilling indoors (on a grill pan on your stove….do not haul your charcoal grill inside and then blame me when you burn your house down), you can simultaneously make the sauce and grill the steaks and dinner will be ready in half an hour. If you’re grilling outside, I would suggest you enlist the assistance of an accomplished grill-master if you have one, that way you can devote your attention to the sauce. My Hubby is a spectacular griller, and he can even give me accurate time estimates so we can make sure everything makes it to the table at the same time. He has had lots of practice. Heat butter in a skillet over medium heat. Add onion and cook until lightly browned. Add garlic and mushrooms. Cook, stirring frequently, until mushrooms have browned. Serve atop a juicy grilled steak, or as a topping for a baked potato, or give it a try on some pasta!